Virtual reality technology has really kicked it up a notch in the past few years. VR headsets are becoming more and more available (and affordable) to the general public. Thus, gaming publishers start producing more and more games based on the VR system. If you think about it, there is just something so liberating about VR gameplay. By not having to play with a controller that uses both hands, or the traditional mouse and keyboard setup, you have a looser play experience. If you think about it, this type of gaming experience started with Nintendo’s Wii, which provided a realism-based game set. You could play tennis, bowling, or even boxing using a unique controller equipped for each hand. It had simpler designs and controller layouts, while also being easier to learn. The controllers were simple, giving it a non-threatening aura. These hard-to-learn controllers often come with consoles, and may prevent newer users to try them out. This gave the games a lot of market when it comes to newer users. With virtual reality gearing up to be the ‘future’ of gaming, we have to appreciate the many benefits you have on it. Virtual Reality Darts for example gives the chance for people to play the game without any of the ‘real world obstacles’. For one, you need a lot of space for a dartboard to be possible. Throwing around darts can also be dangerous in the wrong hands. This danger is intensified with the presence of children or pets in the house. The possibility of a wary dart injuring somebody is always a possibility. Anyone can walk into the door (a usual spot to place dartboards) and receive an unnecessary needle poke. Durability and longevity of these dartboards also come to question when used frequently enough. With use, these boards eventually are peppered with darts, to the point where they become unusable. Even if you can still use them, a peppered board looks awful, and can ruin the entire room’s design. With simulation and a VR headset, you can now play these real world games from the comfort of your home. It does not matter how big or small the space is, and it also does not pose a risk to smaller kids and pets around the house. With Virtual Reality simulation, you get all the upsides of playing the game and completely negate the negatives. These negatives include buying a new board every few months, repairing broken darts, buying new ones, fixing dulled tips, and many more. Here, you can still play with your friends while still retaining the competitiveness and realism of the sport. 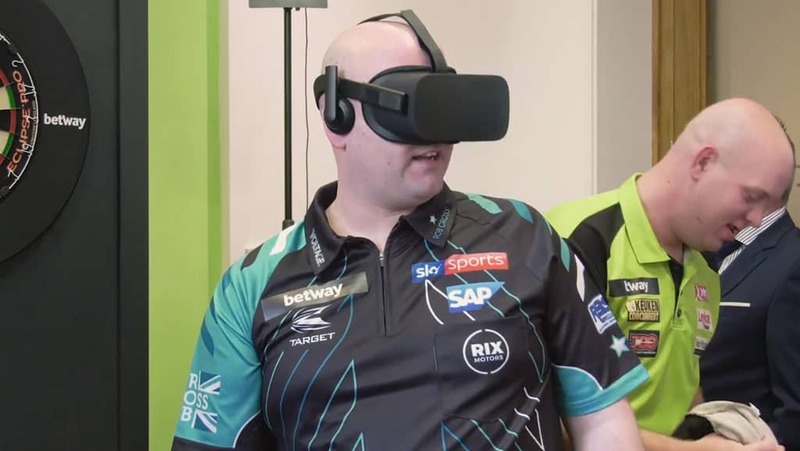 For example, a recent video highlighted world-class dart champions competing in the virtual reality version of the game. They used a gaming setup one can also use on other games available in the system. This gives you the opportunity to buy once, and play many VR games available without any added expenses.